In early July, Gina and I visited our younger son David at Camp Blue Star in Hendersonville, North Carolina for parents weekend. This is his first full summer at sleep away camp. The weekend gives the counselors a break from all the kids. 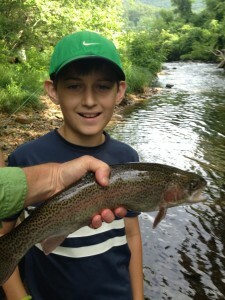 As many of you may know, my 11 year old son David loves to fish. That weekend, I took him fly fishing. It was my first time ever fly fishing. I hired a guide to show us how to fly fish. Imagine standing in cold (Florida standard) stream water up to your waist for 3 and ½ hours hoping to catch a fish. I do admit that I had a preconceived notion of fly fishing. I have bass fished before and I thought it would be similar. When you bass fish, you drop a line, the fish bites, you fight and reel him in. Fly fishing is not at all like that. You use the fly fish rod to aim for the general area to catch the fish. The lure is a handmade fly that floats above the water that is painted bright colors on its top so you can see it from afar. You cast the fly to the desired area upstream from where you believe the fish will be and let it drift with minor adjustments. If the fish bites, you have to pull the rod toward the current in order to hook it. The fish bites in a small amount and the fly slightly moves. If you miss the tiny movement of the fly, you will miss the fish. After 3 and ½ hours of watching a fly drift down the current, I found I could not worry about the past or get concerned about the future. I was in the moment, and mentally on fire for several days afterward. As you invest in the stock market, bond market, ETF market, etc., you cannot take your mind off it for one moment. One of the reasons I mostly utilize institutional money managers is that their sole job is to watch the portfolio. My main job is if the world is going to end, is to yank the money into a more conservative stance (cash or conservative income). Most investors miss opportunities because they wait too long to enter a stock or go all to cash after a decline (sell too early). There is a fine line between being very conservative and being too conservative. Our fishing experience ended with David catching the largest rainbow trout in the last 3 weeks. And I caught one of the smallest fish. The guide has a catch and release program. After we brought the fish above the water to be photographed, he lovingly released it. Fly fishing can teach us a lot about ourselves, the environment, and also investing.